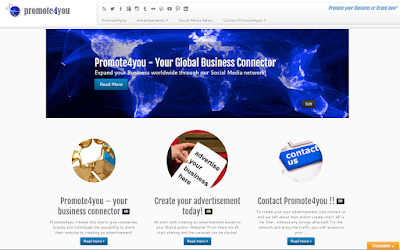 Business Promotion Global with Promote4you! Hi I am Gerrit Bes and started this initiative recently to give Businesses and/or Brands the possibility to make advance of my global social media network and to make advance of the social networks from the other advertisers on this site. Because that will be the power doing Business Promotion Global with Promote4you , expanding each others social media networks and businesses now and in the future! Ok, you do not understand the idea? Well Imagine all advertisers will frequently (daily, weekly) share there own Post/Advertisement on their Social Media Networks, like I do! This will attract visitors to come to the site and while looking around, they also see your advertisement too. You will be seen because of the visibility we will create. grow together! Ofcourse it also depends on how many advertisers we have on the site. The more the better. Beside that, daily we will also share interesting Last Social Media News around, to create extra and new visitors around and maybe new advertisers! 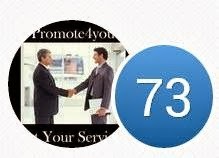 We are also busy to create Promote4you communities on Facebook, linkedin and Google+. The communities are already created but start sending invitations to the communities, will start later in the process. Step by Step. Ofcourse you can allready join, because all communities are open. Now you think, why not buying website traffic? or buying followers on Twitter or buying followers for your FB page etc etc! I am allready pretty a while on the social media since 2007 when i started my linkedin account, so mark my words! You can’t buy engagement on the social media to attract people doing business with you! Therefore you, do your Business Promotion Global with Promote4you! Go to the contact page to see how to create your advertisement! Wishing you happy networking and doing great Global Business together!